CHAMPAIGN, Ill. — Mixed-plastic electronics waste could be a valuable source of reusable polymers, a new study led by Illinois Sustainability Technology Center scientists suggests. The team has developed the first energy-efficient and environmentally friendly process that separates mixed polymers so that they can be recycled into new, high-quality plastic products. E-waste from refrigerators, televisions, computers, monitors, mobile phones and video game consoles is an ever-increasing burden to landfills and the recycling industry. While parts of these materials are readily recyclable – glass and metals – the remaining plastics are a challenge because of their complex mixed-polymer composition. "Items like water bottles and milk jugs can be recycled easily because they are made from single polymers," said ISTC researcher and study co-author B.K. Sharma. "Other plastic items, like cellphone cases, for example, are made of more complex polymer blends. They pile up at recycling centers and eventually end up being incinerated or sent to landfills because there are no safe or efficient means of recycling them." The team's findings, published in the journal ACS Sustainable Chemistry & Engineering, are the first to demonstrate a nontoxic, nondestructive and energy-efficient chemical solvent process to recover polymers from these more complex plastic blends. 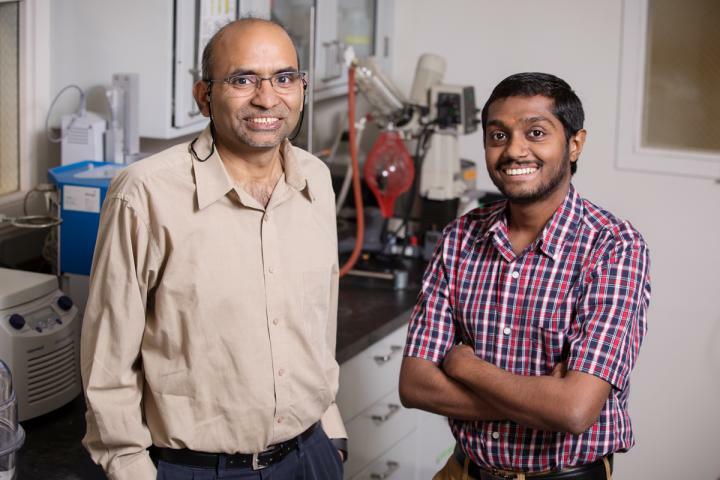 "The process used to dissolve industrial polymers is not all that different than making hard candies," said ISTC research engineer and co-author Sriraam Chandrasekaran. "With candy, you dissolve sugar grains in water, allow the liquid to become saturated with sugar, evaporate the water and recover the polymer, which in this case is the candy. In our lab, we use plastic polymers instead of sugar and the solvent we use is stronger than water." The most efficient solvent methods in use today involve a chemical called DCM, which releases carcinogenic vapors into the air at near-room-temperature conditions. These vapors contaminate the workspace and introduce the potential for release into the atmosphere, the researchers said. "Our process uses a solvent called NMP, which will only release vapors when heated to 180 degrees Celsius, far above the temperature needed to dissolve the polymers," Chandrasekaran said. One particularly efficient feature of the new process is the ability to condense the evaporated solvent for reuse again and again. "The objective of studies like these is not only to find ways to recycle this abundant mixed-plastic waste, but to do so efficiently in an environmentally benign way," Sharma said. The savings don't end there, the researchers said. The process leaves behind some residual polymer waste. However, the researchers can convert those remnants into usable fuel oil by a thermochemical process called pyrolysis, further diverting these plastics from landfills. "Ideally, we would like to chop that step off and have the solvent process end in a complete recycle," Chandrasekaran said. The team has successfully demonstrated this new solvent process with small quantities at the lab scale, and it has produced polymers with comparable quality to their virgin-material counterparts. "The next steps will be to run the recycled polymers through a manufacturing process and test for quality," Sharma said. "If successful, we can then begin a pilot-scale project." HOBI International, Inc. and the ISTC Hazardous Waste Research Fund supported this research. The ISTC is part of the Prairie Research Institute at the University of Illinois. The paper "Materials and energy recovery from e?waste plastics" is available online [LINK: https://pubs.acs.org/doi/abs/10.1021/acssuschemeng.7b03282] and from the U. of I. News Bureau [LINK: [email protected]].